Make light work of scanning everything from A4, A5, and business cards to long document rolls (up to 3 metres), envelopes, plastic cards and passports. Security comes as standard including password log in, auto logout, request for address confirmation before sending and remote management of users and settings. Power and flexibility to integrate with document workflows using the customised metadata index files created with every scan, allowing for easy document classification. Administration tool software allows you to manage multiple ScanFront scanners at a time. You can check the current status of the ScanFront scanners on the network, configure settings, manage users, back-up and restore configuration data. 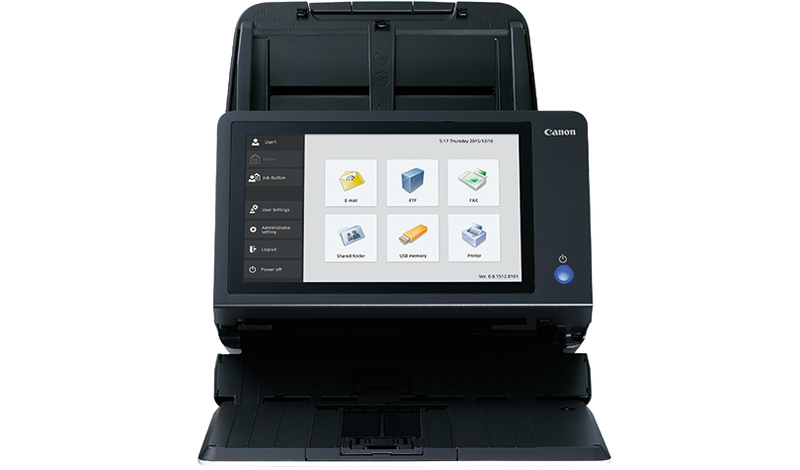 Take advantage of the uniFLOW support for Canon’s ScanFront network document scanner to improve scan-capture workflows and enjoy more value from your Canon fleet. Featuring compact design and ultra-reliable document feeder, ScanFront can be positioned where it’s most needed to capture a wider range of documents more efficiently. Our Business Solutions Developer Programme (BSDP) is dedicated to give you access to a range of technical information to assist development of applications for our range of business products. Replacement roller kit for paper feeding mechanism. Includes retard roller and feed roller unit. Re-usable A4 carrier sheet for scanning documents with irregular shape or requiring extra protection. Pack of 5. Re-usable protective carrier sheet for scanning a passport – clear front with white backing. Pack of 5.